Holiday parties…oh the weight of those words! The very phrase, You are invited … makes some women quiver with fright! And why? Three words…WHAT TO WEAR??? Well, let’s just clear the air and take a deep breath! All is not lost! Let me introduce one wonderful item that can take any outfit, no matter how drab and make it fab! Need reasons to LOVE the black sequined cardigan? Here you go! When I think sweater I think casual, I think jeans, I think bringing wood in and building a fire. I DO NOT think party. Therefore, unless it’s an “ugly sweater” party, skip the sweater and go for the cardigan. Cardigans (mostly) have buttons and buttons make things seem more tailored and fitted. Someone took an extra effort to make all of those little button holes and to sew on those beautiful button baubles. In turn, you took the extra effort to buy and recognize such tailoring extras and this makes a cardigan more party appropriate. If the “cardigan” does not have buttons…is it really a cardigan or just a sweater playing dress up? Methinks it’s a sweater and if so, re-read the first reason. Oh for the love of glitter and all things sparkly! 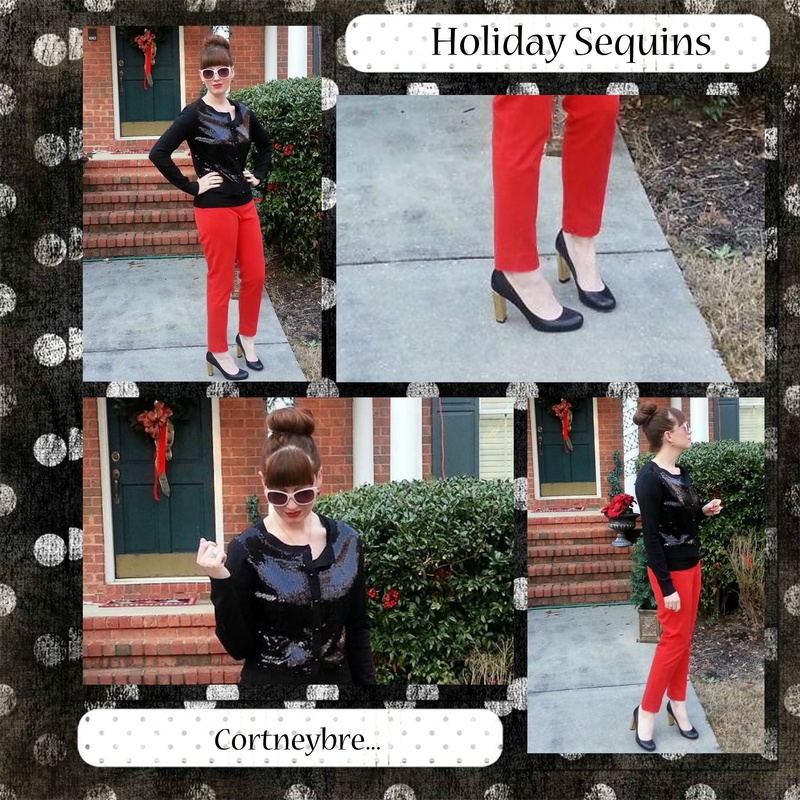 Sequins…one cannot get enough! Do I need to tell you that sequins add depth and glamour?! They are brightening as they reflect light and can add pizzazz to the drabbest of attire. Sequins signal the party has begun! Just do not be surprised if people want to “pet” your sequins…this has happened to me and the safest response is to back away slowly. You can wear black with just about everything..except maybe brown but even that can be made to work. (Come on…black and brown to a Holiday party…really?…you can do better). So, once you have the sequined cardigan, you’ve pretty much gotten the outfit all picked out! Just grab a skirt or pair of slacks of your choosing and you’re all set! Abundance! They’re easy to find! Just search “black sequined cardigan” and you’ll find many options to choose from and purchase online. This is much easier than trying on dress after dress at the department store!